Since Nov. 14, 1959, I have always wanted to engage in conversation with Bryant Harvard, the Auburn quarterback who figured prominently in the outcome of that memorable game against Georgia. He fumbled at the Auburn 35-yard line with less than three minutes to play, which gave Georgia a last chance for victory. The Bulldogs succeeded with a scoring drive, which ended when Fran Tarkenton threw a13-yard touchdown pass on 4th down to Bill Herron to give the Bulldogs a 14-13 victory and the Southeastern Conference title. With Thomasville often on my agenda, I made arrangements last spring to visit with Harvard and talk about the game. His view is pragmatic and one that all athletes should remember. You do your best, and if the final results are not favorable, just move on, which is what Bryant did. After all, it is just a game. It is not life and death. Although his fumble gave Georgia opportunity, he did not lose the game. Who missed tackles on the ensuing Georgia drive? Who failed to successfully defend the several Bulldog passes? Interestingly, 1959 was the second year of the adoption of the two-point conversion rule. As the game played out, Auburn had kicked two field goals, when Georgia’s Charley Britt returned a punt 39 yards for a touchdown in the third quarter to give his team the lead, 7-6. However, 12 plays later, Britt, from his “searchlight” position in punt formation, actually backed into the punt of Georgia’s Bobby Walden. Auburn recovered at the Georgia 1-yard line and scored to go ahead, 12-7. This set up a classic “go for two” situation. Coach Shug Jordan of Auburn elected for the point-after-touchdown kick, however, which turned out to be in Georgia’s favor. Through the years, I have heard Auburn coaches — including Vince Dooley, who was a War Eagle assistant at the time — pontificate about the Auburn sideline decision. They all agree, in retrospect, that a two-point conversion should have been attempted. With the Tigers leading by six points, 13-7, a touchdown and a PAT kick by Georgia would win the game, which is the way it turned out. Harvard, however, doesn’t second guess his old coach, whom he revered. In fact, he doesn’t second guess anybody. Football is a game of mistakes, and the team that makes the fewest is the team most likely to win. After earning a degree at Auburn, Harvard returned to his hometown of Thomasville. He was drafted by the AFL Boston Patriots but had no motivation to play professional football. He was, however, interested in giving the PGA tour a try, even though his commitment to football at Auburn kept him from the amateur competition that would have given him the seasoning he needed to enhance his career. Playing the tour — as a “rabbit” in those days — he qualified for several tournaments but had trouble making cuts. He was married and didn’t want to raise his children “in a motel.” His family owned Sunnyland Packing Company, so he came home and went to work in the family business. When the business was sold in 1985, he settled in on his 230-acre farm a few miles south of Thomasville, where he lives today. He produces grass-fed beef (“God’s beef is what it is”) and does woodworking. “That chest of drawers,” he said as he pointed to his unfinished work, “is for my daughter.” He chooses wood from his property, which is not only practical and economical, but also sentimental. Bryant Harvard appreciates college football. He is grateful for the game providing him an educational opportunity. He hasn’t allowed a topical fumble to ruin his life. He is doing very well, in case anybody is interested. All you have to do is visit him at KBH (Kathy, Bryant Harvard) farms. A man who happily raises grass-fed beef and is an expert carpenter who enjoys the good life should get high marks from anybody who has a seasoned regard for college football. Fran Tarkenton is one of the most decorated quarterbacks in terms of victories and stats in the NFL. In college he had great success as well, but his stats were solid, not great, but not bad. In 1959 during his junior season, he completed 62 passes for 736 yards and six touchdowns. None were bigger than the play in which he called against Auburn trailing by 6 with under a minute to go. The future NFL star made the right decision as he hit Bill Herron with a 13-yard touchdown strike and after the extra point the Dawgs won 14 to 13 which propelled Georgia to a SEC Championship. Pat Dye played high school football at Richmond Academy where he was selected All-American and All-State while leading the team to the 1956 3A state championship serving as team captain. Following this success, The Atlanta Journal-Constitution selected Dye as Georgia's 3A Lineman of the Year for 1956 before being recruited to the University of Georgia. While playing for the Bulldogs under head coach Wally Butts, Dye was a first-team All-SEC lineman and two-time All-American (1959 and 1960). The Atlanta Touchdown Club named him the SEC's Most Valuable Lineman in 1960. Upon graduation from Georgia, Dye played three years of professional football as a linebacker for the Edmonton Eskimos in the Canadian Football League. 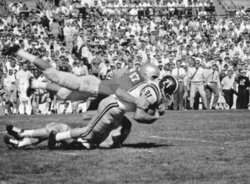 End Bill Herron made the spactacular, turned upside-down catch for the winning touchdown versus Auburn in 1959. Herron was drafted in 1960 by the Redskins in round 13 (#148 overall). After being cut by the Redskins he played the 1960 season with the British-Vancouver Lions of the Canadian Football League. 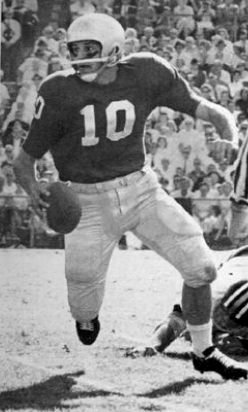 The nation was first introduced to quarterback Fran Tarkenton in the '60 Orange Bowl Classic, as the Georgia senior used his scrambling ability to lead his team to a 14-0 win over Missouri. Tarkenton threw for two touchdowns on broken plays and completed nine of 16 passes for 131 yards. In the first quarter he threw 29 yards to sophomore halfback Bill McKenney for a 7-0 Georgia lead, and in the third, he scrambled free again and found end Aaron Box open on a 33-yard scoring strike. Missouri Coach Dan Devine praised Tarkenton lavishly, but he also said the hard-knocking Georgia defense was a big factor. Missouri, which broke Oklahoma's grip on the Big Seven championship, led in total yardage, 264 to 223, but couldn't get across the goal line as three interceptions stopped potential scoring drives. Georgia head coach Wally Butts coached his last Bulldog game.